Over the last few years I have flirted with the pulls on either end of this spectrum and having found no clear answers, have remained blissfully unclear about my true north. The Ibisbill has been on the list of my ‘must-have’ species for quite a while now. The first time I saw one was in Jan 2015 while we were on the banks of the Jia Bhoreli in Nameri – if I remember t’was a pair that flew past, low over the water while we were chasing Pratincoles. The next time was in Corbett in May 2016. I haven’t come across the bird ever since though there has been significant time and effort expended if there was even a whiff of a chance of snagging a pic – Leh in July 2017 comes to mind. So, when we heard the call (of the Ibisbill) while driving along the Gurudongmar Road to Lachen, we had to stop and scan. A pair was spotted on the far bank of the river down in the valley floor and there wasn’t even any doubt of what needed to be done. It had been a wet and cold night and the overnight snow was starting to slowly melt under the bright sunshine. However, it had been a particularly heavy snowfall and most of the slopes were still blanketed by a white carpet. 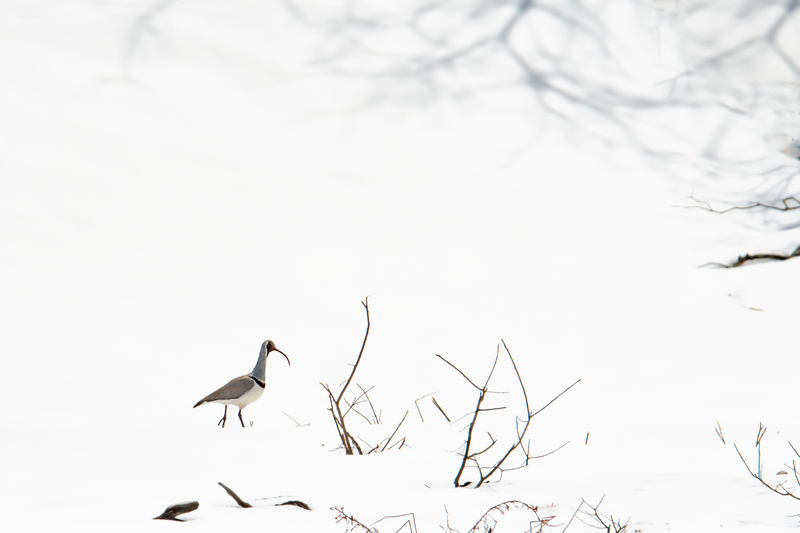 The Ibisbills were walking around in the snow and as we were trekking down to the level of the river I remember Rajesh and I discussing this frame – just the Ibisbill and the snow with as little distracting elements as possible. 4 years and 3 months since my first sight of this bird, here I present my first ever click of this bird. It is not a tight close-up or a standard profile, it isn’t even a tack-sharp image. But this image answered an existential debate. And I love it for that. I am a photographer who birds. Art is so essential to me I would give up birding before I give up photography. I love the ethereal ibis. Excellent composition and it tells a story.